Santa Claus and Mrs. Claus. Mrs. Claus' full name is Jessica Mary Claus. Her mother picked her middle name after the mother of Jesus. How Does Santa Deliver His Presents If There Is No Chimney? At one time all houses had chimney's so this wasn't a problem for him. 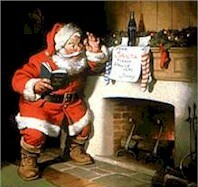 But when stoves were invented that didn't need chimneys, that presented a real problem for Santa. friends who have the magical ability to pass through walls. They were easily able to enter houses and leave Santa's gifts for the children. As more and more children were born, and the world's population grew to amazing numbers, Santa asked the help of parents all over the world. 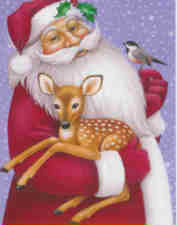 Very often parents will leave a door or window unlocked so that Santa may enter. part of The Magic of Christmas. Why Doesn't Mrs. Claus Go With Santa on Christmas Eve? Mrs. Claus is the brains behind the whole deal. You may have heard it said that, "Behind every great man, is a great woman". of every single day around here. She is the one that makes sure that we take care of ourselves and don't ignore the truly important things in life. Why if we didn't have Mrs. Claus, I don't know what we'd do. Is There More Than One Santa Claus? If There Is A Fire In The Fireplace, Why Doesn't Santa Get Burned? When he comes down the chimney his magic freezes the fire until he steps out of it. His red suit was specially designed by the elves to smother the fire just long enough for him to get through it without getting burned. How Does Santa Fit Down A Chimney? He was given the magical power to become small enough to fit down any chimney, along with anything he is carrying. He becomes like smoke and can go through the smallest cracks or openings. How Can Santa Keep Track of All The Boys & Girls? controlled office in Santa's Village. a very special, Top Secret Project for the North Pole. Why Doesn't Santa Get Old? What Was The FIRST Toy Santa Claus Ever Made? What Languages Does Santa Claus Speak? All of them. Especially on Christmas Eve. How Long Is Santa Claus' Beard? the length of a young elf. Does Santa Have a Family? everyone who believes in him is part of his special family. Does Santa Claus Get Any Presents Himself? parents and family for gifts they may give you! Can The Magic of Christmas Ever Stop? Unfortunately Yes.....Santa's Christmas Magic can stop only if Boys and Girls stop believing in him. Without children believing in Santa Claus there would be no need to deliver toys......and thus the Magic of Christmas would be no more. What Can I Leave For Santa To Eat When He Comes To My House? Santa likes cookies and milk, but really he will like anything you put out that you like. Although he doesn't eat any reindeer meat. One time someone put out some octopus meat for him, he tried it, but decided to take it home to his cat, Lady Whiskers, she enjoyed the octopus meat a lot more than Santa did. and his one very special pet is his cat, Lady Whiskers. one of the editors of Pet Care Tips. Every year for Christmas, Alfred sends Lady Whiskers a Gift Certificate for one years supply of Life's Abundance Premium Cat Food and a years supply of Gourmet Cat Treats!